When homeowners are looking to enhance the overall security or curb appeal of their home, landscape lighting designs are the way to go! Not only will you help to provide a higher level of protection for your family, but the value of your property will also improve. By illuminating the focal points around your home in a natural way through the installation of landscape lighting, you’ll be able to enjoy the many advantages associated with brightening up your outdoor living space. 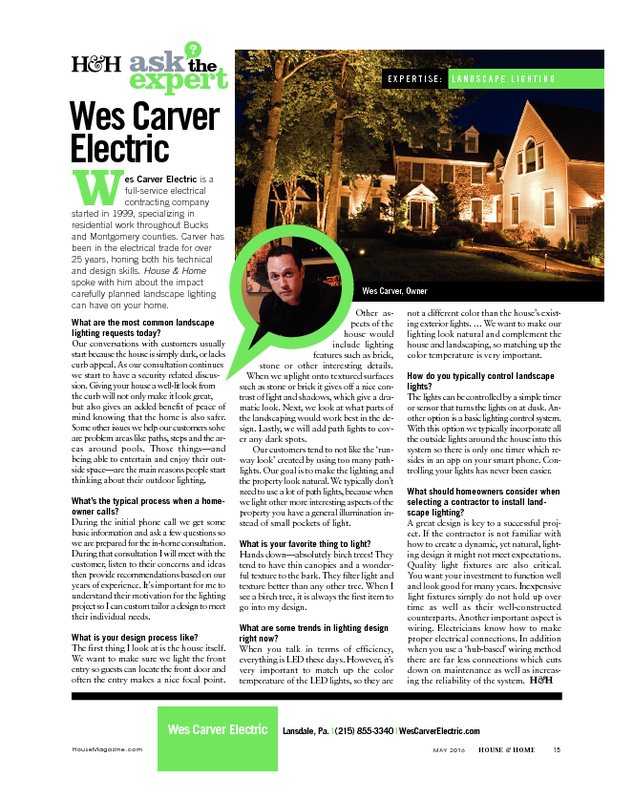 Impressively, Wes Carver, the owner of Wes Carver Electric, which is a full-service electrical contracting company, located in Lansdale, PA, is featured in the “Ask the Expert” section of the May 2016 Issue of House & Home Magazine. For over 25 years, Carver has been sharpening his design and technical skills, in regards to the landscape lighting and general electric industries, so that he can better serve his customers. Below, are three quotes from the recently published article that help to emphasize the importance of choosing an experienced and knowledgeable crew of electricians in Warrington, PA and neighboring towns to install landscape lighting on your property. Choosing an electrical contracting company that’s willing to put in the appropriate amount of time to completely understand a homeowner’s desires means everything. Electrical professionals must be able to spend time with their customers so they can bring their visions to fruition. How else will they be able to manifest the landscape lighting design of your dreams? While some companies are just interested in completing jobs as quickly as possible, you need an electrical contracting company that’s dedicated to interpreting what it is that you see in your imagination. This is just one example the many crucial aspects of the design process that might be overlooked if you ask a landscaping company instead of an electrical contracting company to install your landscape lighting design. As mentioned before, the lighting should illuminate important features of your home in such a way that it appears natural. You need a company that strives to facilitate a naturally brightened outdoor space. On top of everything else, make sure that the company of your choosing uses high-quality light fixtures to ensure the functionality of your investment for many years to come. You should also make certain that proper electrical connections and innovative wiring methods are used throughout the installation process. “Hub based” wiring methods, for example, limit the number of necessary connections and help to cut down on the required maintenance of the system, as well provide an ideal level of dependability. When you choose a company to implement a landscape lighting design on your property, use Wes Carver Electric’s way of doing business and performing installations & electrical repairs in Bucks County, PA as an accurate example of how your chosen company should perform their services. Don’t be left in the dark when you can brighten up your outdoor environment through the experience and knowledge of the experts.